Dr. Barr is a Professor of Radiology, Northeastern Ohio Medical University, and a Diagnostic Radiologist at Radiology Consultants Inc., Youngstown, OH. A 42-year-old male who is an avid runner had an injury 2 months prior. The pain at his heel area persisted despite conservative management and was increasing when he presented. The patient had no other medical problems, but a history of 2 torn ligaments in the past. The patient underwent a magnetic resonance imaging (MRI) scan of his hind foot. The proton-density weighted MRI (Figure 1) demonstrates the presence of an abnormal signal involving the Achilles tendon. The diagnosis of Achilles tendinitis was made. There was no evidence of a significant tear, although minimal tears could not be excluded. There was no evidence of bone-marrow edema, ankle-joint effusion, or fluid surrounding the Achilles tendon. 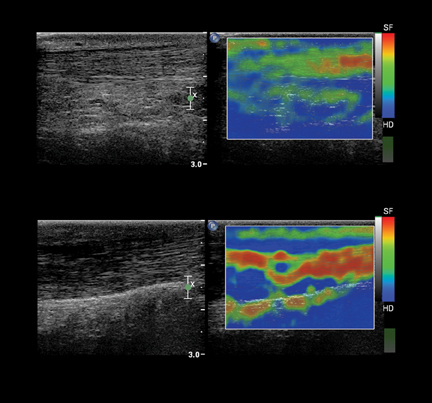 An ultrasound (Figure 2) of the Achilles tendon was performed, including strain elastography at the same time. The B-mode ultrasound showed an area of decreased echogenicity within the tendon, which on elastography is soft (red) compared to the normal tendon, which is hard (blue). Fusing the MRI and ultrasound images (Figure 3) shows the area of tendinitis is similarly identified on both techniques. 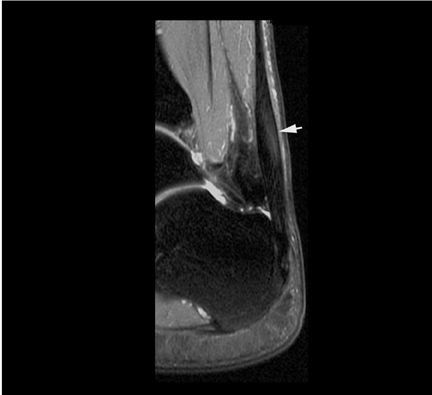 The patient’s MRI confirmed the diagnosis of Achilles tendinitis. The patient was placed in a cast for 4 weeks with significant symptomatic improvement. A follow-up ultrasound (Figure 4) shows that the area of soft (red) tendinitis has resolved and a small area of green (intermediate hardness) is present, consistent with a scar/healing area. Musculoskeletal elastography is in its infancy.1-4 Current studies show that tendons are one of the stiffest tissues in the body. Pathologies, such as tendinitis or tears, can cause the relative stiffness to lessen. MRI is considered the standard technique for evaluating these changes. However, ultrasound elastography may be able to evaluate these changes at a lower cost than MRI and allows monitoring of healing. By monitoring the relative softness as well as the size of the area affected, one can monitor treatment and may be able to better tailor treatment to the patient’s healing. In addition, ultrasound is useful for demonstrating dynamics of muscle and tendons. It is also easy to obtain the contralateral images for comparison. Strain elastography is a promising new technology that has the potential to change the present clinical patterns in diagnosis and patient management in musculoskeletal imaging. Ongoing studies will help to define the role of strain elastography in musculoskeletal imaging. De Zordo T, Fink C, Feuchtner GM, et al. Real-time sonoelastography findings in healthy Achilles tendons. AJR Am J Roentgenol. 2009;193:W134-W137. Trombetti J. Sonoelastography and musculoskeletal imaging. http://www.dotmed.com/news/story/7760/?lang=en. Updated December 23, 2008. Accessed August 28, 2012. Schreiber V, Smekal V, De Zordo T, et al. Real-time sonoelastography in rotator cuff imaging and comparison to magnetic resonance imaging as gold standard. RSNA 2009. http:// rsna2009.rsna.org/search/event_display.cfm?em_id=8016421&printmode=Y&autoprint=N. Updated 2009. Accessed August 29, 2012. De Zordo T. Value of real-time sonoelastography in lateral epicondylitis: Comparison with clinical examination, ultrasound, and power Doppler ultrasound. Radiological Society of North America 94th Scientific Assembly and Annual Meeting; November 30th - December 5th, 2008; Chicago, USA. Updated 2008. Accessed August 29, 2012. Elastography in evaluation of musculoskeletal abnormalities. Appl Radiol.